The world of manufacturing is changing rapidly, with products being designed, made, and used in new ways. At Tecton, we offer solutions that include the latest manufacturing technology trends. 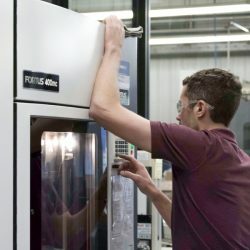 Through additive manufacturing, Tecton can produce complex one-off prototype parts as well as production runs out of a variety of plastics. Tecton’s speed coupled with additive manufacturing makes possible same-day, turnkey fixturing solutions from concept to finished part. This proven process greatly decreases lead time and increases throughput. Common to AM technologies is the use of a computer, 3D modeling software (CAD), machine equipment and layering material. Once a CAD sketch is produced, the AM equipment reads in data from the CAD file and lays down or adds successive layers of liquid, powder, sheet material or other, in a layer-upon-layer fashion to fabricate a 3D object. AM application is limitless. Early use of AM in the form of Rapid Prototyping focused on pre-production visualization models. More recently, AM is being used to fabricate end-use products in aircraft, dental restorations, medical implants, automobiles, and even fashion products.